Basically the punk rocker of the Dwarf world they adopted dyed spiky hair, chains, leather, apathy and probably safety pins if you looked closely enough. Very 100 Club circa 1976. 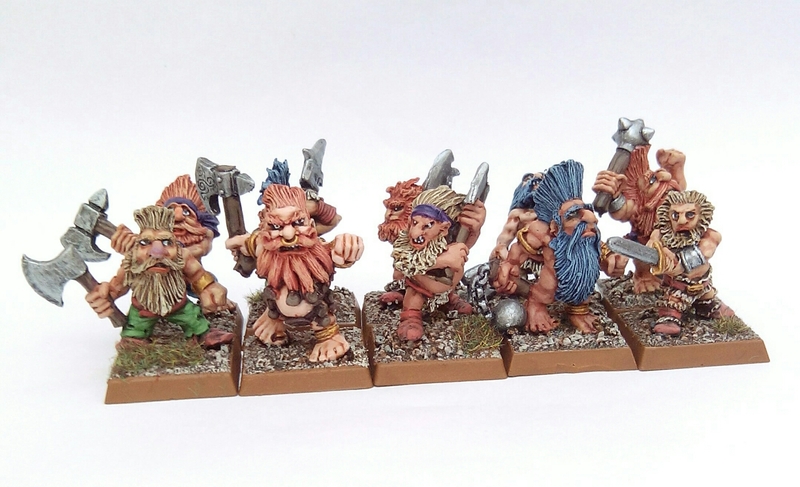 Dwarf berserkers were already a thing in WFB and make an appearance in ‘The Magnificent Sven’ scenario included in 1984’s 2nd edition ruleset. They were subject to ‘alcoholism’ and ‘frenzy’ rules and even had a hint of the morose about them in times of peace and sobriety, however the full transformation into what famously became the Troll Slayer happened a little later. For older Grognards their first introduction probably came with WFRP in late 1986. The Troll Slayer was a PC career for Dwarfs and one individual famously featured on the front cover illustration by John Sibbick. This wasn’t the first mention of the doomed and disgraced vertically challenged. That came in 1985 with the Dwarf Lords of Legend boxed set that included Kimril Giantslayer. This is possibly the first use of Giant Slayer in a Warhammer Dwarf context. I also think he’s the Slayer Sibbick used as the basis for his WFRP cover. Throbin Death Eye came in this set too and looks like a Troll Slayer however with no mention of Trolls at this stage I suspect he was still technically considered a Dwarf berserker. By 3rd Edition WFB (late 1987) the berserker had been sidelined and the Troll Slayer was firmly planted in the game. The later Felix and Gotrek novels ensured it’s lasting popularity. Even today it’s still in AoS – albeit under a different name. Like most things over time with GW the Troll/Giant/etc etc Slayers became more and more ridiculous, a parody of themselves with impossibly coiffured Mohican haircuts and gigantic battle axes. And of course they all started to look the same; much as the Punks of the early 1980s who, protesting their individuality, were really just tired clichés; emulations of 1976 wearing what had become a universally recognised uniform of Punk. 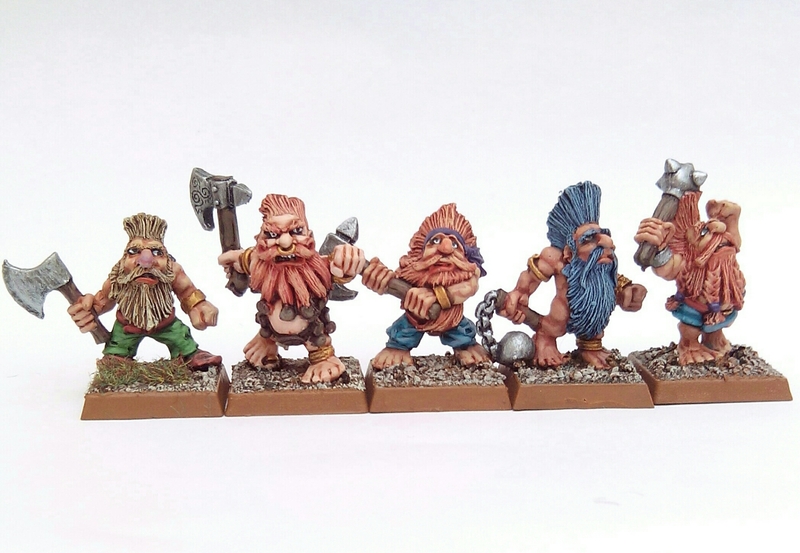 Anyway here’s some Dwarfs I’ve painted. The first photo is mostly older berserker miniatures including Juggo Jorikson of ‘The Magnificent Sven’ fame (and also included here is Kimril Giantslayer). The Dwarf on the left is the oldest GW Dwarf berserker miniature I know of and is pre slotta. 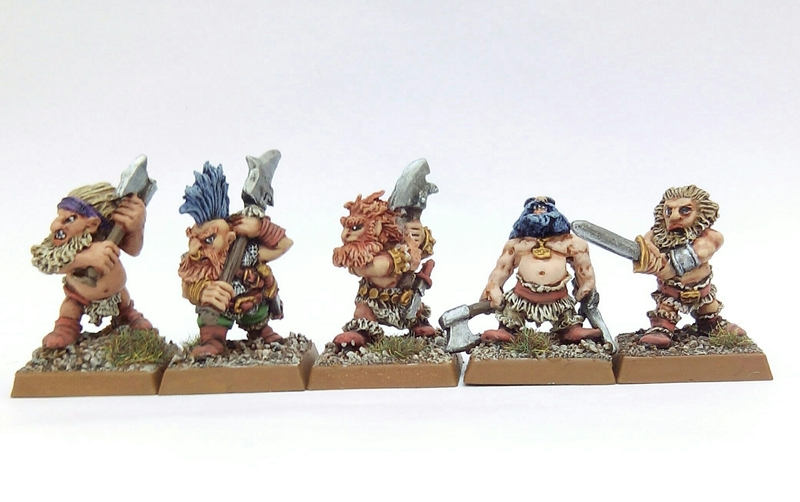 The next photo are early 1990s Troll Slayers from GW’s offshoot Marauder Miniatures. You will notice the size creep in these miniatures compared to the early berserker models. Later Troll Slayer figures were even bigger. This entry was posted in 1985-1990 and tagged Citadel, dwarf, troll slayer, Warhammer on October 23, 2016 by Hobgoblin Orange.